Hospital disinfectant is highly effective against TB, MRSA, HIV-1 (AIDS virus), poliovirus Type 1, hepatitis A, Influenza A H1N1 virus and Norovirus. Tuberculocidal, virucidal, fungicidal, bactericidal. Eliminates odors and prevents the growth of mold and mildew. NSF Category Code D1. EPA Registered. INNER PACKAGING: 12 Cans Per Case. 19 oz. Per Can. Click here for the Safety Data Sheet for this product. 19 oz. Disinfecting Wipes, Cleaners and Sanitizers from Lysol! 4287 In Stock today. Select Styles: 1. Select Item Quantities, 2. Click "Add to Cart"
Cleaning and maintaining facilities is simple with the right janitorial supplies including cleaners, scrubbers, gloves, mops, brooms and more. 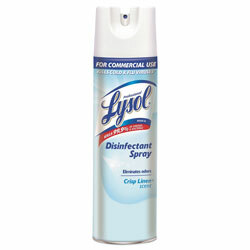 ReStockIt.com has professional lysol brand disinfectant spray 12 per case available at up to 40% discount. Brooms, cleaners and mops are also available. ReStockIt.com is the source for janitorial and cleaning supplies. You're now signed up for emails to get exclusive discounts! 1-800-680-0859 | Copyright © 2004-2019 ReStockIt, Inc.